The radical left's effort to silence conservative media by targeting their advertisers with coordinated smear campaigns has gone unanswered for too long. It’s time the conservative movement fights back, but with a big difference – we'll tell the truth! The next time the Left bullies advertisers into boycotting conservative voices, we will hold that advertiser accountable. We will also be closely monitoring every cable and network news show and informing their advertisers and the American public when they go beyond political commentary and engage in smear, hate and the promotion of violence. 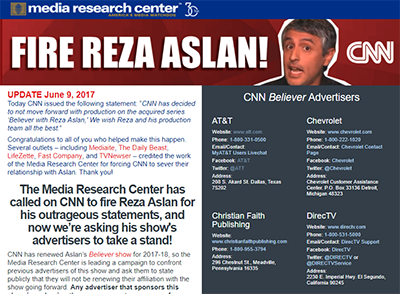 Our message to the advertisers: If you continue sponsoring that show, we will publicly associate your company with the outrage you're sponsoring. We're going to let these advertisers know we’re mad as hell, and we're not going to take it anymore! Sign up for the MRC Action Newsletter!